The collections of the Monterey History and Art Association have grown through contributions since its founding in 1931. 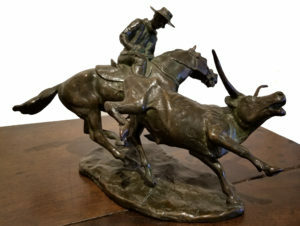 Early contributing members include artists Myron Oliver and Armin Hansen, and founding president Col. Roger S. Fitch, who was one of Roosevelt’s Rough Riders. At the present time, the Association maintains art and artifact displays at the Mexican-era adobe Casa Serrano, and the Mayo Hayes O’Donnell Library (a historic former Episcopal church), our collections hold Monterey’s story. 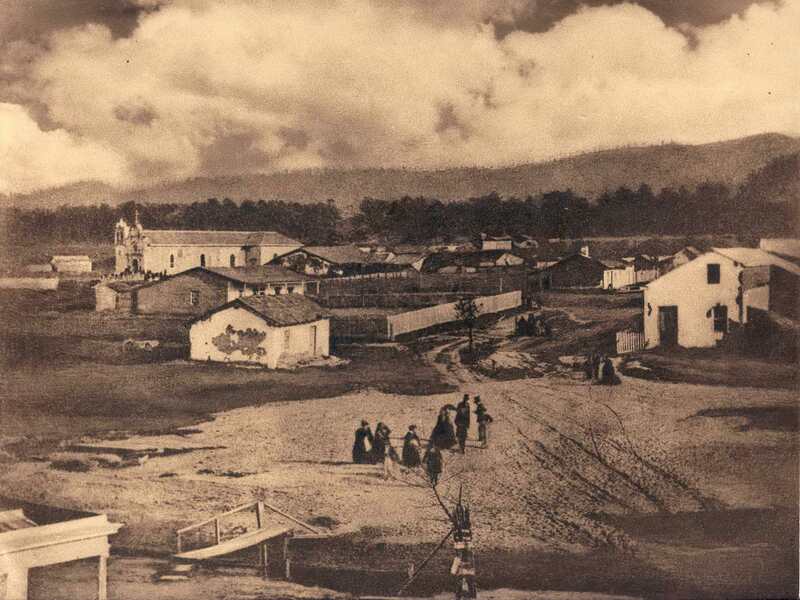 Entwined with historic events, deeded gifts have come from families of early prominence, as well as community residents who were part of the daily life and commerce that put Monterey on the map. Because of this, our collections address the significant historic milestones of the first capital of the Western United States. The collection reflects early California art, including works from some of Monterey History and Art Association’s founding members. We house one of the largest single collections of work by California sculptor and artist Jo Mora. Other significant artists in our collection represent the Plein Air and Bohemian movements, including Armin Hansen, E. Charlton Fortune, Charles Rollo Peters, M. Evelyn McCormick, and Myron Oliver, among others from the Monterey Group and Society of Six. The costume collection contains several significant examples of American dress from the mid-19th century through the late 20th century, from some of California’s earliest families. The collection also includes costumes from the many Monterey immigrants’ native cultures. The strengths of the collection include Belle Époque dresses, worn by early tourists to the region, coastal worker’s uniforms, representing several historic industries of the region, and a diverse collection of early to mid 20th century hats. Our decorative Arts, featured in historic Casa Serrano Adobe, include handcrafted pieces that belonged to some of Monterey’s first families. Many objects, including a grand piano, were shipped around Cape Horn, in the early 19th century. Some of the tables, benches, and chairs were created here in Monterey. The adobe’s other period furnishings include American pieces, including examples such as a Federal secretary, and a John Belter chair. 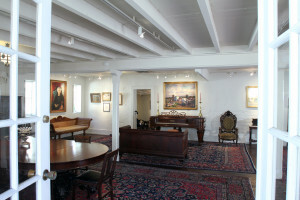 The Porter Bedroom contains the furniture of John T. Porter, a Civil War customs collector in Monterey appointed by Lincoln, who lived at the Custom House. Housed at the Mayo Hayes O’Donnell Library, our collection of rare books, original letters, media, and photographs are available free of charge to scholars and researchers of early California history. Included are the personal papers of Mayo Hayes O’Donnell, Amelia Elkinton, Mayor Minnie Coyle, Judge Monte Hellam, and Col. Roger S. Fitch. Visit the Library’s web site for details about educational and research information available at the Library and to explore the extensive on-line collection of old photos, biographies, Noticias del Puerto de Monterey archive, book holding list, and much more. Our artifacts provide the visual touchstones that bring to life the Monterey described in Dana’s Two Years Before the Mast (1840) and Stevenson’s Across the Plains (1892). Objects pertain to early Spanish explorers and the Mission settlements of Father Junipero Serra, through Mexican independence, to the declaration of US territory in 1846 by the arrival of Commodore Sloat’s naval fleet. Other objects come from the railroad magnates’ Hotel Del Monte, and the longtime military presence in Monterey. Further artifacts tell the shared history of diverse groups who have traveled to Monterey, from the earliest Ohlone and Rumsien tribes, who settled here in 4000 BC, to the Chinese families who pioneered commercial fishing on the bay, from Russian and Aleut fur trappers, to Portuguese whalers and Japanese abalone divers. Our collection also consists of objects from Cannery Row, and from Italian-Sicilian fishing families, whose fleet brought in the fish that kept the canneries running day and night.